Genuine WonYong π-water products(Pi-Ceramics & Pi-Systems & Pi-Solutions) are developed and produced by original WonYong π-Water technology. We are supplying the only original(genuine) Pi-Water in the world. The quality is completely different from that of all other imported ones(counterfeits). The fake Pi-Water has not actual effect at all. The products which are selling with the name of "Pi Water" that not from genuine WONYONG are all counterfeits. - Pay special attention to some fake advertisement even though it is not actual Pi-Water, especially in Japan and USA. Original Pi-Water manufactured by original technology of WONYONG that is completely different from products made in Japan or America, etc. Pi-Water products that from all other manufacturing companys(from Japan or America, etc) are 100% fake(It is not actually Pi-Water). For example, fake Pi-Ceramics is not Pi-Ceramics but general ceramics. Case 1. Selling fake Pi-products that is not from Genuine WONYONG. => All are not Genuine Pi, All imitations. - Causes side effect)" . actual Pi-Water effects at all. by false technology. That fake patents can not make genuine WonYong pi-water effects. Please beware of fake patents by false technology company. There are some fake Pi-Water being sold in the market, confusing some consumers. The fake Pi-Water has not actual effect. Therefore, pay attention to buying the Pi-Water. [Notes] You can not expect the real effect of Pi-Water when it comes to imitations. ▲ Is the "WonYong Corp. in Korea" the only genuine Pi(π)-Water manufacturer in the world ? Our company is strictly protecting our original technology from disclosed to other. So, no other company can manufacture it. Imitation Pi-Water products which are made in Japan and USA are all fake products with no correct effect of the Pi-Water. We are manufacturing and supplying the only real Pi-Water based on the original principle of Pi-Water. So, pay attention to the imitations. 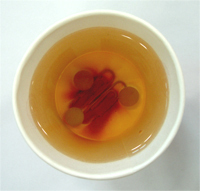 The product which is not the original WonYong Pi-Water supplied by us has no or only a very weak effect. ▲ Why we do not register the patent of our original pi-water technology? It is the rule that we don't release(register) the patents. Because our original Pi-Water technology is not imitable at all. Releasing(registering) patents make others imitate the technology. Patents has expiration date. So, materials(Not imitable technology) do not release(register) the patents. For example, that is the reason why "Coca cola" does not register the patents. Generally, almost analysis possible technology register patents to prevent imitation, but analysis impossible technology do not register patents to prevent imitation. So, we don't register patents because genuine WonYong Pi-Water technology is not imitable at all. Patents are no relation to products quality at all. So, anyone can register fake patents by false technology. Many patents abuse this point for consumer. Please bewares of fake patents by false technology company. Fake patents can not make genuine WonYong Pi-Water effects. Please do test with all imitation products(from all Japan, USA, etc.) compare with our original genuine WonYong products. Please do test all actual experiment results on our web-site of original(genuine) WonYong Pi-Water technology. After all, you can realize that WonYong is the world's only genuine Pi-Water maker. All Pi-System by fake Pi-Ceramics from all Japan, USA, etc. 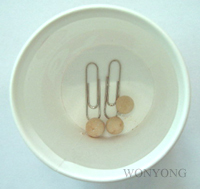 (not from genuine WonYong) => Iron clip rust same as general water. Pi-Ceramics from all Japan, U.S.A. are counterfeits. * Alkaline water(Alkaline Ceramics)(pH 8~9~over), Magnetic water(Magnet), etc. also have not these effects. And besides...The verious effects of the only genuine WonYong π-Water. All effects are entirly different between genuine WonYong and other imitations(from all Japan, USA, etc.). All contents of WonYong π-Water are about the world's only genuine π-Water, "WonYong π-Water" just by WONYONG(manufacturer). These effects demonstrate only by genuine WonYong π-Water.